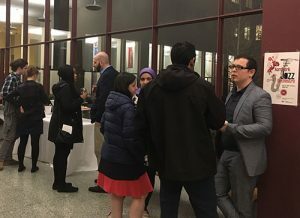 On the evening of Saturday, April 21, graduate students and their partners enjoyed a concert by the Aardvark Jazz Orchestra and a reception sponsored by the Office of Graduate Education (OGE) and hosted at Killian Hall. The Aardvark Jazz Orchestra featured Duke Ellington classic jazz. Tickets sold out within days of their initial offering, and demand and excitement for the concert was especially high. Specifically directed at graduate students with children as a “date night out,” the OGE provided subsidized child care both in the Westgate Lounge and in student homes on and off campus. Overwhelming feedback validated the tremendous benefit of the free babysitting; graduate student parents could take a break from both their academic and parental responsibilities for a few hours to hear the classic jazz of Duke Ellington and socialize with each other. Students and their spouses and partners put on their fancy attire and genuinely treated the event as a proper night out. After a lovely performance by the Aardvark Jazz Orchestra, which is led by Mark Harvey of MIT’s Department of Music and Theatre Arts, attendees mingled in the outer hall and courtyard. The event’s reception included catered hors d’oeuvres, beverages, and bar. Graduate students chatted with their peers, making new introductions and connections. Many orchestra musicians, including MIT Professor Emeritus Jay Keyser, stayed for the reception and struck up conversation with the students. Graduate students and musicians mingled at the reception. Several MIT offices, including Residential Education, the Music and Theatre Arts department, and Parking worked cooperatively with the OGE to bring the all details of this event together. 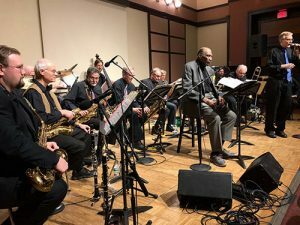 Due to the Aardvark Jazz Concert’s success, the Office of Graduate Education intends to offer similar activities for graduate students in the future.